From the first time Hugo Chavez was elected President of Venezuela in 1998, Washington and its allies have been trying to undermine his government. When Chavez was just a presidential candidate, the US State Department denied his visa to participate in television interviews in Miami. Later, when he won the presidential elections, Ambassador John Maisto called him personally to congratulate him and offer him a visa. The following months were filled with attempts to “buy” the newly elected President of Venezuela. Businessmen, politicians and heads of state from Washington and Spain pressured him to submit to their agendas. “Come with us”, urged Spanish Prime Minister Jose Maria Aznar, trying to seduce him with offers of wealth and luxury in turn for obeying orders. When Chavez refused to be bought, he was ousted in a coup d’etat April 11, 2002, funded and planned by Washington. When the coup failed and Chavez’s supporters rescued their democracy and president in less than 48 hours, attempts to destabilize his government continued. “We must make it difficult for him to govern”, said former US State Department chief Lawrence Eagleberger. Soon, Venezuela was overrun with economic sabotage, oil industry strikes, chaos in the streets and a brutal media war that distorted the reality of the country on a national and international level. A plan to assassinate Chavez with Colombian paramilitaries in May 2004 was impeded by state security forces. 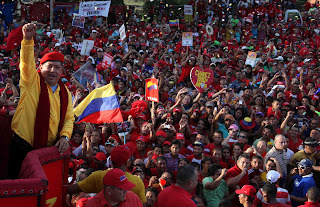 Months later, the US-backed opposition tried to revoke his mandate in a recall referendum, but again, the people saved him in a 60-40 landslide victory. The more popular Chavez became, the more millions of dollars flowed from US agencies to anti-Chavez groups to destabilize, descredit, delegitimize, overthrow, assassinate or remove him from power by any means possible. In December 2006, Chavez was reelected president with 64% of the vote. His approval rating grew in Venezuela and throughout Latin America. New governments in Argentina, Brazil, Bolivia, Ecuador, Honduras, Nicaragua, Uruguay and several Caribbean nations joined regional initiatives of integration, cooperation, sovereignty and unity, encouraged by Caracas. Washington began to lose its influence and control over its former “backyard”. The Bolivarian Alliance for the Peoples of Our Americas (ALBA), the Union of South American Nations (UNASUR), PetroCaribe, PetroSur, TeleSUR, Bank of ALBA, Bank of the South and the Community of Latin American and Caribbean States (CELAC) were created. Washington isn’t included in any of these organizations, nor is the elite that previously dominated the region. In January 2005, Secretary of State Condoleezza Rice said Chavez was a “negative force” in the region. In March, the Central Intelligence Agency (CIA) placed Venezuela on their list of “Top 5 Hot Spots”. A few months later, Reverend Pat Robertson publicly called for the assassination of Chavez, claiming it would cost less than “a $2 billion war”. That same year, when Venezuela suspended cooperation with the US Drug Enforcement Administration (DEA) because it was found committing acts of espionage and sabotage, Washington classified Venezuela as a nation “not cooperating with counter-narcotics” efforts. No evidence was presented to show alleged Venezuelan government ties to drug trafficking. In February 2006, Director of National Intelligence John Negroponte referred to Venezuela as a “dangerous threat” to the US. Secretary of Defense Donald Rumsfled compared Chavez to Hitler. That same year, Washington created a special intelligence mission dedicated to Venezuela and Cuba, increasing resources for operations against them. In June 2006, the White House placed Venezuela on a list of countries “not cooperating sufficiently with the war on terror”. The classification included a sanction prohibiting the sale of military and defense equipment from the US and US companies or those using US technology to Venezuela. No evidence was ever shown to back such serious claims. In 2008, the Pentagon reactivated its Fourth Fleet, the regional command in charge of Latin America and the Caribbean. It had been deactivated in 1950 and hadn’t functioned since then, until Washington decided it was necessary to increase its presence and “force” in the region. In 2010, the US established an agreement with Colombia to set up 7 military bases in its territory. An official US Air Force document justified the budget increase for these bases in order to counter the “threat from anti-American governments in the region”. International media call Chavez a dictator, tyrant, authoritarian, narco, anti-American, terrorist, but they never present proof for such dangerous titles. They have converted the image of Venezuela into violence, insecurity, crime, corruption and chaos, failing to mention the incredible achievements and social advances during the last decade, or the causes of the social inequalities left behind from previous governments. For years, a group of US congress members - democrats and republicans - have tried to place Venezuela on their list of “state sponors of terrorism”. They claim the relationships between Venezuela and Iran, Venezuela and Cuba, and even Venezuela and China evidence the “grave threat” represented by the South American nation to Washington. They say again and again that Venezuela and Chavez are threats to the US. “He must be stopped”, they say, before he “launches Iranian bombs against us”. In an interview a few days ago, President Barack Obama said Chavez was not a threat to US security. Republican presidential candidate Mitt Romney said he was. The ire of the Miami Cuban-Venezuelan community came down upon Obama. But they shouldn’t worry, because Obama increased funding to anti-Chavez groups this year. More than $20 million in US taxpayer dollars have been channelled from US agencies to help fund the opposition’s campaign in Venezuela. Is Venezuela a threat to Washington? In Venezuela, the only “terrorists” are the groups trying to destabilize the country, the majority with political and financial support from the US. The drug traffickers are in Colombia, where the production and transit of drugs has increased during the US invasion disguised as Plan Colombia. Relations with Iran, Cuba, China, Russia and the rest of the world are normal bilateral – and multilateral – ties between countries. There are no bombs, no attack plans, no sinister secrets. No, Venezuela is not that kind of threat to Washington. Poverty has been reduced by more than 50% since Chavez came to power in 1998. The inclusionary policies of his government have created a society with mass participation in economic, political and social decisions. His social programs – called missions – have guaranteed free medical care and education, from basic to advanced levels, and provided basic food items at affordable costs, along with tools to create and maintain cooperatives, small and medium businesses, community organizations and communes. Venezuelan culture has been rescued and treasured, recovering national pride and identity, and creating a sentiment of dignity instead of inferiority. Communication media have proliferated during the last decade, assuring spaces for the expression of all. The oil industry, nationalized in 1976 but operating as a private company, has been recuperated for the benefit of the country, and not for multinationals and the elite. Over 60% of the annual budget is dedicated to social programs in the country, with the principal focus on eradicating poverty. Caracas, the capital, has been beautified. Parks and plazas have turned into spaces for gatherings, enjoyment and safety for visitors. There’s music in the streets, art on the walls and a rich debate of ideas amongst inhabitants. The new communal police works with neighborhoods to battle crime and violence, addressing problems from the root cause. The awakening in Venezuela has expanded throughout the continent and northward into the Caribbean. The sensation of sovereignty, independence and union in the region has buried the shadow of subdevelopment and subordination imposed by colonial powers during centuries past. No, Venezuela is not a threat to US security. Venezuela is an example of how a rising people, facing the most difficult obstacles and the brutal force of empire, can build a model where social justice reigns, and human prosperity is cherished above economic wealth. Venezuela is a country where millions once invisible are today, visible. Today they have a voice and the power to decide the future of their country, without being strangled by foreign hands. Today, thanks to the revolution led by President Chavez, Venezuela is one of the happiest countries in the world. That is the threat Chavez and Venezuela represent to Washington: The threat of a good example.